David J. Lipman, MD, who served as the director of the National Center for Biotechnology Information (NCBI) since its creation almost 30 years ago, is assuming the position of Chief Science Officer at Impossible Foods, a company bringing innovative molecular techniques to the food industry. Under Dr. Lipman’s leadership, NCBI has become an essential resource for biomedical researchers, health professionals, and patients, as well as the biotechnology and pharmaceutical industries. During his tenure, NCBI grew from a handful of staff working to link biomedical literature and DNA sequences to a staff of hundreds who produce more than 40 integrated databases that serve scientists and the general public. Major NCBI databases include GenBank for DNA sequences and PubMed, one of the most widely used sites in the world for the search and retrieval of biomedical information. Each day more than three million users access these and other NCBI databases and download more than 50 terabytes of data. Dr. Lipman and the GenBank team were finalists for the Samuel J. Heyman Service to America Medals, known as the Sammies, from the Partnership for Public Service. Dr. Lipman was recognized for building and heading the world’s largest and most influential repository of genetic sequence data. 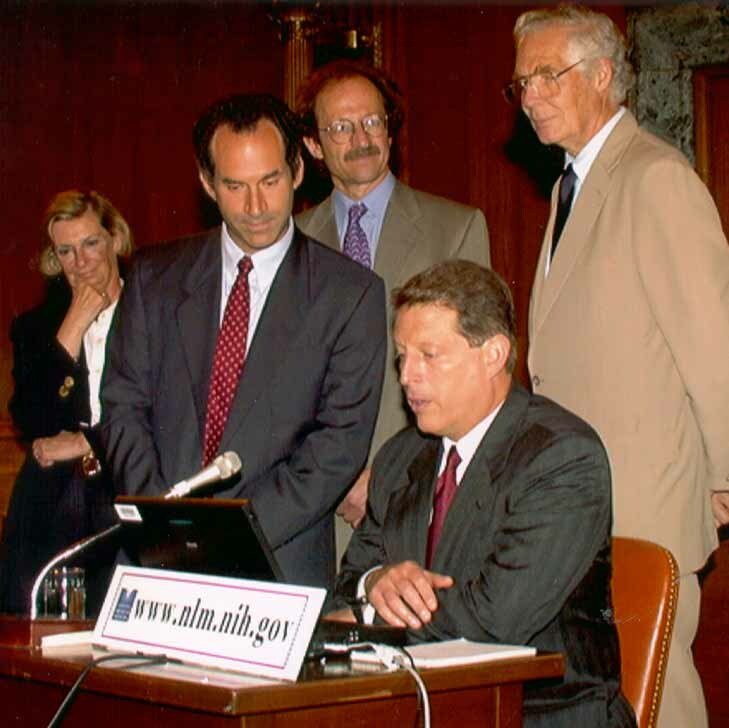 Vice President Al Gore (seated) joined (l to r) MEDLINE user Suzanne McInerney, NCBI Director Dr. David Lipman, NIH Director Dr. Harold Varmus, and Dr. Donald Lindberg at a Capitol Hill event hosted by US Senators Tom Harkin (D-IA) and Arlen Specter (R-PA), inaugurating free access to MEDLINE via PubMed. 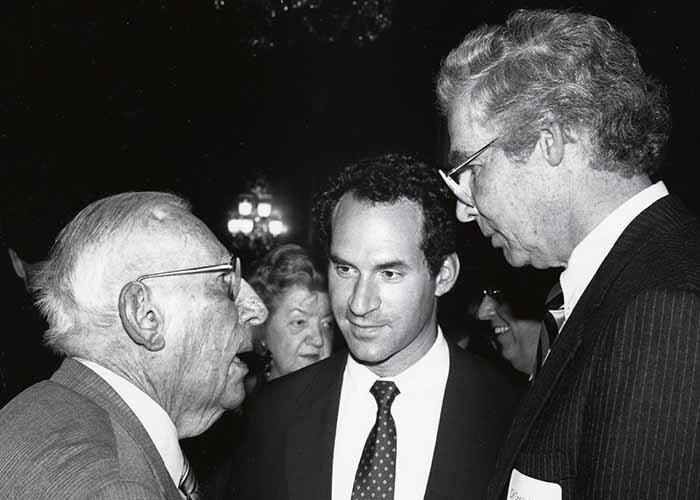 Dr. Lipman has been an advocate for promoting open access to the world’s biomedical literature and launched PubMed in 1997, followed by the full-text repository, PubMed Central (PMC), in 2000. He was instrumental in implementing the NIH Public Access Policy whereby NIH-funded papers are made publicly available in PMC. He has also maintained an active research program in influenza evolution and molecular evolution of the genome and proteome. Working with the CDC, FDA, and USDA, he has developed a system for applying whole genome sequencing to the surveillance and detection of foodborne pathogens. These methods have significantly improved the speed of detecting the source of foodborne disease outbreaks. His research in creating rapid sequence comparison algorithms such as FASTA and BLAST has earned him an international reputation, and his journal articles describing the methods are among the most highly cited in biology. Among many honors, he is an elected member of the National Academy of Sciences (USA) and the Institute of Medicine, and a fellow of the International Society of Computational Biology, the American Academy of Arts and Sciences, and the American College of Medical Informatics. He received the prestigious Jim Gray eScience Award from Microsoft in 2013. ← Eh, What’s Up, DOCLINE? How About 40 Million Requests!